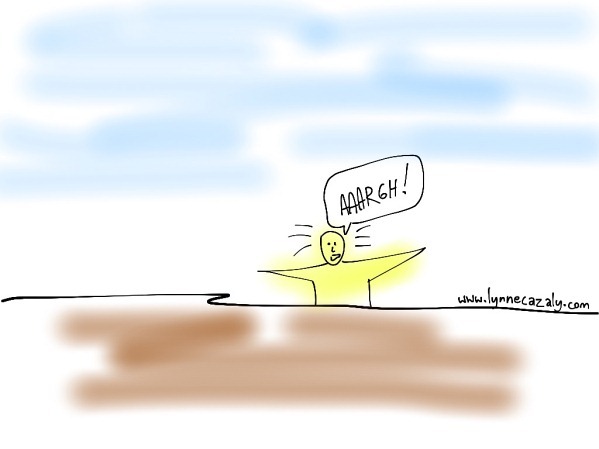 Lynne Cazaly spoke at the recent Agile New Zealand conference on the importance of clarity and sense-making in a world where VUCA (volatility, uncertainty, complexity, ambiguity) is the norm. She presented ideas on how to convey messages more effectively using visual tools and gave the audience a quickfire class on communicating using simple images. The images she created in the talk can be found here. She spoke to InfoQ after her talk. InfoQ: This is Shane Hastie at the Agile New Zeeland conference and I am here with Lynne Cazaly. Lynne is a speaker, author, mentor, adviser and expert in visual communication and facilitation. Lynne welcome. Lynne Cazaly: Thanks Shane, good to meet up with you again. InfoQ: You gave a really interesting talk this morning in which you gave us some tools of visual communication. Leading up to that you explained why this stuff is so important in today’s world. One of the things you used was the acronym VUCA, what’s that about? Lynne Cazaly: That’s a military term that has been around for a few years now and it nicely represents the kind of crazy world we live in of Volatility, Uncertainty, Complexity and Ambiguity. That constant change, that constant upheaval, the massive uncertainty the world is in. We talk about change, continuing to change but it’s great that it’s got a name now, you can go in the world and see what sort of things you can do to make it easier for people we work with …as well as ourselves. InfoQ: Your focus at this conference is on visual facilitation and visual communication - how does that help in this world of VUCA? Lynne Cazaly: A big part of it is uncertainty, a great human fear when we don’t know what is going to happen, the example I gave this morning is when you wait for the results of a medical test you are in this place called “liminality” where you don’t know anything for certain, you are in limbo between here and there, and a lot of work that happens in organizations that leaders have to lead is leading through this uncertainty. “We’ve got this plan but we don’t quite know what’s going to happen next”. And given the fears people have, whatever you can do to allay their fears, apart from giving them a box of tissues and a box of chocolates what serious and helpful things can you do- and one of the big things that you can do is show people where they are, so show people what their current reality is, what is the picture now and where we are planning to go, and even to acknowledge history: this is where we have been. I think a visual map or a visual metaphor can really help put people at ease in these sort of uncertainties. InfoQ: One of the things that you did mention quite a lot was the need to transform the metaphors into something that is more concrete or visible to people. Lynne Cazaly: Yes, and I think that in the Agile software development world, and broadly the project world, we have quite a very rich visual metaphorical language, we talk about sprints and milestones, and scrums and project walls, and stories and personas and these are all real things but I think we get trapped in our verbal language so one of the powerful things to do is when someone mentions a metaphor is to use it, is to sketch it roughly (it might just be a block on a page or a rough shape) and write the word that they said. The example I gave was that an Agile coach said he felt like he was wading through a swamp or he was waist deep in mud, that is a great metaphor, get it out of the verbal language, make it visible, then you can start to look at what is the stuff that is slowing us down, and mildly remove those barriers. InfoQ: So just by turning it into a picture. InfoQ: But I can’t draw. Lynne Cazaly: It’s not about the drawing, Shane. That fear of drawing is very attention in, you are thinking too much about yourself, you need to be more attention out; that’s what Mark Henderson who is a corporate anthropologist here in New Zeeland says. To be of greater service in your tribe is to have your attention out and focusing on what you can do to help people. So I get a lot of “I can’t draw” but it’s not about you. Reflect or capture or scribe down what someone is saying and it’s true that when you are able to make people feel a bit safer, have greater trust, you get better progress, you get more depth in your conversation, it reduces conflict. I can validate that this is the stuff I work with all the time and I can say the rapid progress that teams make when they make their thinking visible. InfoQ: One other thing that you touched on was the need to make sense. Lynne Cazaly: Yes, there has been a lot of work in the area of sense making, as a technique and a process, Karl Weick has written a wonderful book, Dave Snowden and the Cynefin framework is another sense making tool. I come back a bit from that and I just go very broadly, let’s make sense for people and I think the three ways to do that are that first of all think, then map it out, then act on it. And by the time you know more, so you can think again, and map some more, and act on it and continue to iterate that making of sense. InfoQ: You gave us a great visual for that. 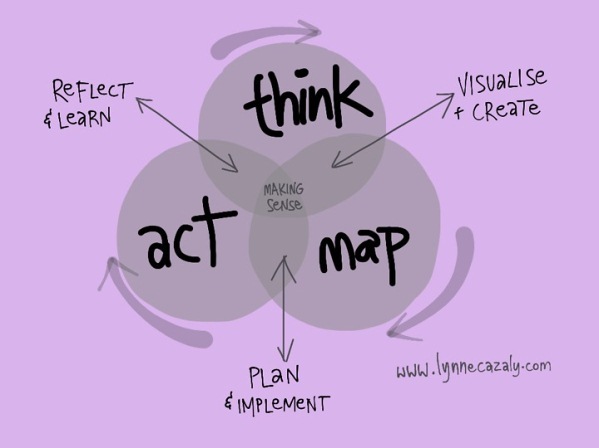 Lynne Cazaly: Yes, three circles in a Venn diagram and then the intersection of those between thinking and mapping help you visualize, between mapping and acting helps you plan, and when you act and think you are able to reflect. InfoQ: The other thing that you touched on was the need for three-point communication. What is three-point communication? Lynne Cazaly: One point communication would be me or you just reading something individually, there you are sitting in a corner reading a book, magazine, e-book and so you are one point of communication, it’s just that piece that you are reading. Two point communication is what we are doing, you and I are having a conversation and so many meetings and work place settings are these, two point communication, or just people standing around talking and to bring it to a next level to three point communication, let’s have something that we are talking about; it is great to see people gathering around the story walls and project plans etc. but the same happens in any team any conversation any session; get that third point of communication going which is the visual map, maybe the artifact but it’s the thing that helps people make sense so you get to great content a lot quicker. InfoQ: Then you took us through how to rapidly communicate some simple concepts. And as somebody who can’t draw you had me drawing. Lynne Cazaly: Enough of that evidence is here, and the sketch books I gave out at the session you’ve got twenty icons that we went through in super quick time and I am really trying to push people beyond the speed of doubt, to say not that I can’t draw but your brain is in a progressive overload mode, you’re drawing and you say “I can do this, how good”, so I love helping people get over that doubt, which is that attention in, “I can’t draw”. Well it’s part of your communication so I think if you can make it a part of what you do; some people say “I hate speaking in public”, or “I’m not a good public speaker” or “I am not a good writer”, we are very attention in in all of our communication, however by using visuals we get just a little bit better with each one, and particularly the visuals people you work with will love you for it. Karl Weick the sense making guru in his book, says that any old map will do so I love to encourage people to just do anything, the caliber and the quality of it doesn’t matter so much, any visual would do. InfoQ: In fact if I could end with a great quote from you this morning, “A small visual anchor holds a weight of information”. InfoQ: Lynne thank you very much for talking to us today. Enjoy the rest of the conference. Lynne Cazaly: You too. Thanks Shane. Lynne Cazaly is a keynote speaker, author and adviser. She is the author of the books: Making Sense: A Handbook for the Future of Work; Create Change: How to apply innovation in an era of uncertainty, and Visual Mojo: How to capture thinking, convey information and collaborate using visuals. She works with executives, senior leaders and teams on major change and transformation projects. She helps people distil their thinking, apply ideas and innovation and boost the engagement and collaboration effectiveness of teams. Lynne assists organizations with creative and engaging facilitated workshops, skills development in creative and innovative thinking and she works with people to help them unlock the ‘entrepreneur inside’. Lynne is an experienced board director and chair and is a global keynote speaker and an executive facilitator. She is on the faculty of Thought Leaders Business School.